Archie Andrews is 65 years old, but he doesn't look a day over seventeen. 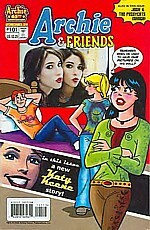 The old codger is joined by his young looking buds, Betty, Veronica, Katy Keene, and Josie and the Pussycats, in the comic book Archie and Friends, and they are all just as hip, er, gnarly, eh, whatever, as the day they were first introduced. Their publishers make sure that Archie and friends never go out of style. Katy Keene takes the spotlight in this issue and is every young girl's fantasy, i.e., to be beautiful, intelligent, accomplished, and admired. That fantasy is perfectly accomplished by artist and writer Andrew Pepoy who is every fanboy's fantasy, i.e., boy has he drawn everything over the years! In this issue, Katy is on the red carpet at the VTV Movie Awards, nominated for "Best Kiss", and the place is packed by gently caricatured real actors and actresses whose names have been changed to protect the innocent, er, the publisher. Pepoy's art is terrific, and he continues the gimmick that has made Katy Keene a cult favorite over the years. Readers design her clothes. His art is reality based, clean, and attractive. His visual storytelling is fun, crisp and flawless. Pepoy's story won't win the Pulitzer, but Archie comics have never really been about plot. They are all about characterization and the experience of growing up. Archie and Friends #101/23 pgs. & $2.25 from Archie Comics/various artists and writers/available at store-front and on-line comics and book-shops, retail outlets, and at www.archiecomics.com. Andrew Pepoy is an associate member of the Oklahoma Cartoonists Museum.